Our previous tip, blocking potentially hazardous websites with hosts file was one of the many methods you can harden your system. You can also install your own caching DNS server and disable ports that are opened by default. These tweaks contribute bit by bit to the overall security of our computer systems. In the tech lingo, it is referred to as hardening. When we blocked potentially hazardous websites via hosts file, you noticed that browsing was faster too. This is because most web tracking elements that run on the background got blocked too. And since that tweak was enforced, your anonymity on the web has improved and you can now browse with a bit more confidence. We can improve on that tweak above. There is a tool made exactly to accomplish the purpose of blocking websites via hosts redirection. That tool is hostsman (by abelhadigital.com). What does hostsman do? In short, it accomplishes the block via a couple of clicks. To see it in action, download hostsman and extract the zip file to a directory of your liking. Make it easy to remember the path where you extract it. Or better yet, after extracting pin hostsman.exe to your taskbar for easy reach. Launch the software. Click the middle button (icon with globe behind computer) to update hosts. Use the overwrite option when updating. Or you can use merge, then optimize later. Whichever option you choose, it accomplishes the same purpose. And this highlights the flexibility of hostsman. What's more? You can disable this blocking in a single mouse click. The first button (green "H" symbol) on hostsman disables the hosts file. Should it block a website you frequent, just disable host blocking with hostsman and when done, just re-enable. When disabled, the green "H" icon is colored red. 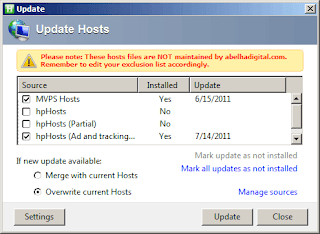 Furthermore, hostsman when used this way does not exactly automate the updates. But it could. Set it to automatically start with Windows -- Tools > Options > System > (tick) Automatically start with Windows. Under Update tick Enable Hosts file Auto-Update. With that you will no longer have to worry about updates to the hosts file. 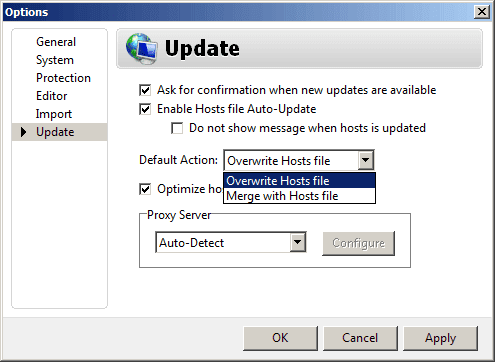 When an update is available, hostsman will notify you of that. Or you can choose not to be bothered at all. INFO: Google Plus Invites Now Open! FUN: Happy Sysadmin Appreciation Day! TECH: Gmail-to-SMS Service For Free!